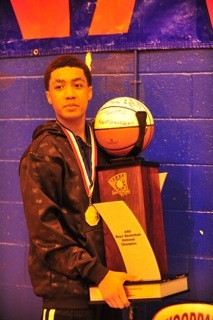 BASKETBALL SPOTLIGHT NEWS: Basketball Spotlight Southern Feature: Jamie Lewis Has Arrived! Basketball Spotlight Southern Feature: Jamie Lewis Has Arrived! Over the years Spotlight has focused on players from the Mid-Atlantic and Northeast and, trust, we will never lose sight of our roots. However we are going to give our readers a view of some intriguing teams and players from the Southeast over the next week or so. Each year several teams gear up for AAU Nationals by adding players to fill gaps or add depth. No team did a better job adding talent than 7th grade Georgia United. The team made an unsuspected 6th grade, Final Four in Hampton and followed up with a National Championship adding 6’ scoring guard, Jamie Lewis. Jamie performed most of the AAU season with powerhouse 8th grade Rockafella of Atlanta, GA, then hooked up with Coach T for Memphis. #7 was Lewis and when we had a chance to sit and watch we were dazzled by his array of shot making and intensity on the offensive end. He plays a very mature offensive game and never seems in a rush or bothered by defensive pressure. We are excited to continue watching this Georgia sniper go for 20+ on a consistent basis.